What's The Water Quality In Your Child's School? Water Matters > News > What's The Water Quality In Your Child's School? With the number of toxins being sent into our environment every day, it can feel like no realm in our lives is safe from water contamination. Unfortunately, we’re here with some more bad news: There’s one additional place where we need to put more thought into the water quality, and that’s our kids’ schools. First, there’s the concern about germs. 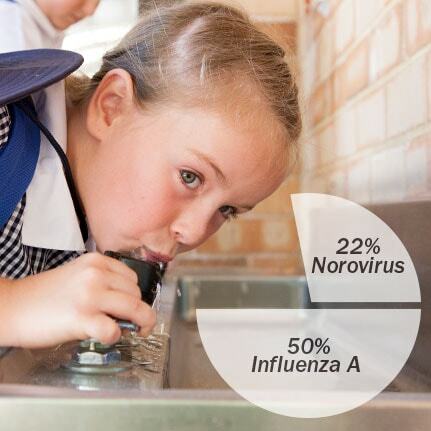 A study of the contact surfaces in preschool classrooms found that 50 percent of surfaces had had the presence of the Influenza A virus, with 22 percent coming back positive for norovirus, which causes gastroenteritis. Where were they most prevalent? Yup: fountain toggles. One reason for this was usually the lack of maintenance and cleaning services for those fountains. Where’s the situation worst? You might be surprised. While we often focus on city schools as having the fewest resources, it’s actually rural schools that fared worst when it came to Water Sanitation and Hygiene (WaSH) coverage. According to a study of schools done by AMI Environmental, “WaSH coverage was significantly higher in urban than rural areas. Presence of drinking water infrastructure (43%) was lower than sanitation infrastructure (64%). Eighty-one percent of schools had no hand washing stations and 74% of schools lacked soap.” On top of it, a majority of rural schools get their water from well water, which is less likely to be treated. How Do Schools Have Lead In The Water? One additional concern? Lead. In order to understand how lead is even getting into water that’s supposedly treated, it helps to understand a little something about water infrastructure. First, most rural schools — where water quality is the worst — get their water from wells, and wells aren’t treated to eliminate contaminants. It’s possible that we may have a better idea of lead contamination levels at rural schools than urban ones, however, because the Environmental Protection Agency (EPA) requires schools that provide their own water to test it. National Geographic reported that testing revealed that, “1 in 5 schools that use well water have dangerous contaminant levels.” But that isn’t necessarily because the water is contaminated before it enters the school. Most often, lead gets into the water supply from old pipes within our very own buildings. So what about urban and suburban schools, then? They get their water from the local municipality, and because of that, the EPA does not require them to test their own water. Cities and municipalities are responsible for maintaining water piping from the water source to the treatment facility, and from the treatment facility to the customer’s property line. But once water hits a customer’s property, those pipes are their responsibility to maintain and replace. Even when that customer is a school. And if that customer is strapped for cash — as our schools so often are — the likelihood they’ve actually replaced their service lines or pipes is increasingly low. Unfortunately, a lot of those pipes were likely made with lead, which can leach into water if it comes into contact with other corrosive metals in the water. Thus, you get lead in the water of schools. Lead is bioaccumulative. That means it stays in a child’s system and builds up there over time. The amount of lead in a school’s water can vary as well, depending on how long the water has sat stagnant. Over the weekends and summer when schools aren’t in use, lead can build up. To make matters worse, in comparison to adults, there are reasons why lead is even more dangerous to children’s health. The first of which is that lead is bioaccumulative. That means it stays in a child’s system and builds up there over time. This is due in part to the fact that the human body can’t discern between lead and calcium. Yes, many of the contaminants that can be found in public school water are also found in homes and other public buildings, but children spend the majority of their development years at school. On top of it, they drink more H2O per pound than adults. 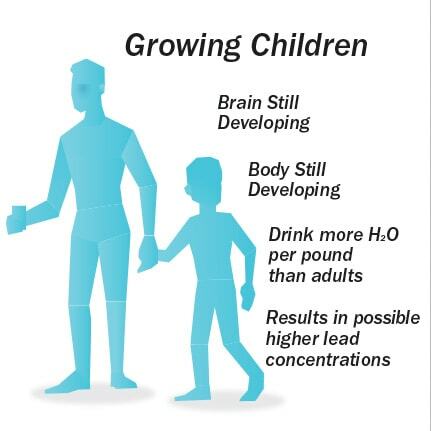 With smaller and still-growing bodily systems, drinking lead contaminated water can result in higher concentrations of lead in children’s bodies. In reaction to lead concerns, some school systems and individual families are turning to bottled water, but the promise there is rather misleading, largely because of the its environmental impact. Americans go through 50 million bottles of water every year, and much of that plastic isn’t recycled (it also doesn’t even count the amount of plastics that are used for other beverages, such as sodas). Since plastic can’t biodegrade, it breaks down into nanoparticles, which end up — guess where? — right back in our water (not to mention air), only perpetuating the problem of water contamination. On top of it, much bottled water comes from underground aquifers, which — while our municipal water also often comes from groundwater — can be over pumped and harm the watershed in that area. Some schools are acknowledging the water issues to the degree that they can. 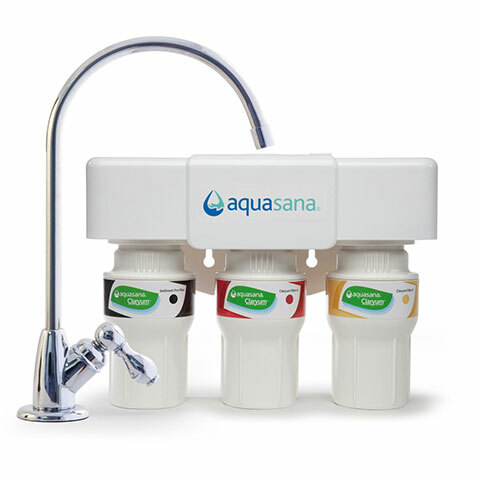 Aquasana is working with Milwaukee public schools to filter water, while other school systems are voluntarily choosing to test their water and seek solutions. But if you don’t live in Milwaukee, what do you do? Parents can take back some control of their children’s school water by exerting pressure on authorities locally. Call on your local representatives to get more funding for your local schools — specifically for water infrastructure. The greater the school resources, the easier it is to regularly clean and maintain school water fountains, as well as replace older pipes likely to leach lead into the water supply. If replacing pipes proves too costly, encourage the purchase of filtering systems for school water fountains in order remove any lead that’s potentially seeping into the water. If even that seems out of reach, encourage schools systems to flush out their water fountains after stagnant periods such as weekends and summers. 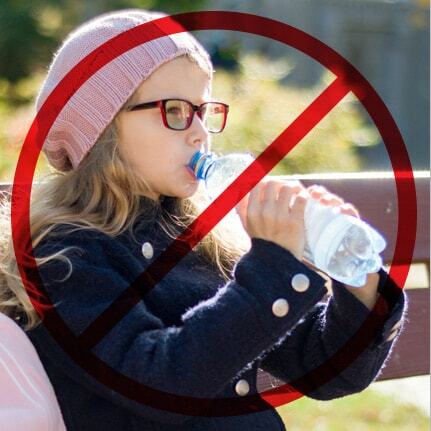 Another alternative to bottled water is simply sending your child to school with a filtered water bottle. 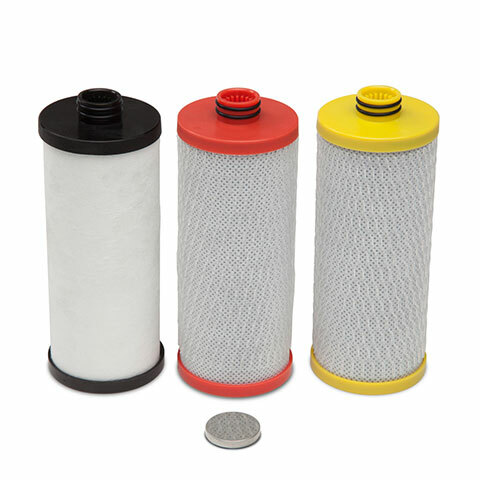 Aquasana’s bottle filters are good for up to 60 gallons of filtration and replacements cost only $15. 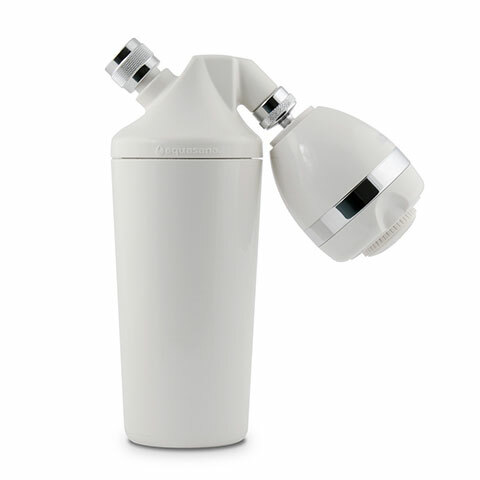 It removes upward of 99 percent of contaminants (including lead) and even has selective filtration technology so that important minerals (like calcium) stay right where they should.